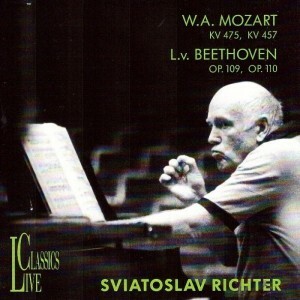 We must be grateful to Live Classics for the label’s series of recordings documenting Sviatoslav Richter’s last public performances in generally excellent sound. The Haydn and Beethoven Sonatas have appeared on the label before, coupled with Bach’s Capriccio on the Departure of his Beloved Brother. The two Sonatas were recorded at a July 3, 1994 concert in Bavaria and, with the release of this record, we now have the complete recital. 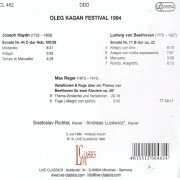 Instead of the Bach we are offered Reger’s massive Beethoven Variations., based on the lyrical Bagatelle, Op. 119/11: Andreas Lucewicz plays the first piano part while Richter has chosen to, as it were, play second fiddle. 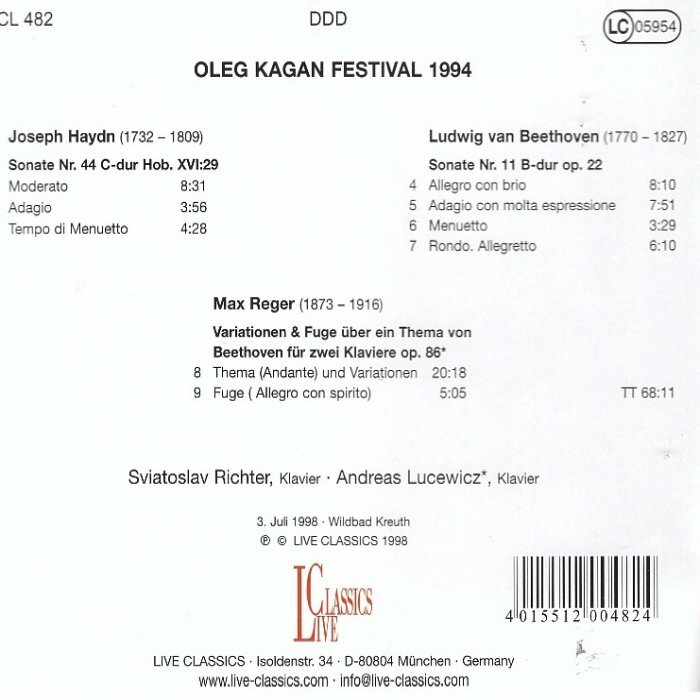 Richter recognised Haydn’s unique genius and revered his music, and this reading of the composer’s improvisatory Sonata 29 is pure magic. 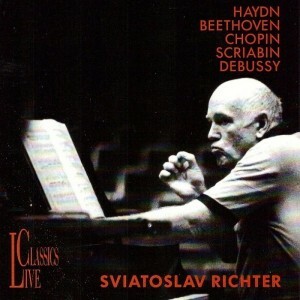 Listeners remembering his mercurial rendering of Beethoven’s Sonata 11 from the early 1960s (Philips) will find the approach broader and more expansive here. Richter’s interpretations became more intimate and somewhat reserved as he grew older. Here is a vital but mature view of this extraordinary work: simple, direct and profound. 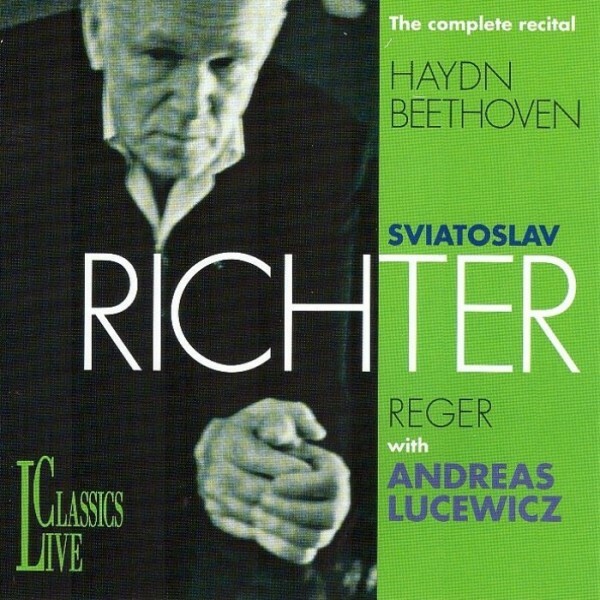 Reger’s great gift was to make the simple complex, and he develops Beethoven’s seedling into a mighty oak. Did I just say that Richter became more intimate and reserved in his old age? Well after listening to this powerfully dynamic reading I am convinced some sort of rejuvenation had taken place. This is towering achievement. The sound, a bit clattery, is still very good. Even if you own the alternate release of the Haydn and Beethoven (Live Classics 461) the duplication is worth it for the Reger. In any event, don’t miss this record part of the ever-growing recorded legacy of one of the truly great pianists of this or any century.